William Edward Wagner was born on July 25, 1971 in Tannersville, Virginia. The farmer from the South, was originally a right hander but after breaking his arm, he learned to throw left handed off the door of his barn. He developed that arm into one that was known to throw a fastball at 100 mph. Wagner set N.C.A.A. records in the small school of Ferrum College getting himself drafted number one by the Astros in 1993. In the minors he was a starting pitcher and in 1994 led all pitchers with 204 Ks at that level. He got promoted in September 1995, and in 1996 saved 9 games and would eventually replace Todd Jones as their closer. Over the next seven seasons (1997 -2003) he would save 30 games or more five times including a career high 44 in 2003. Post Season: In 1997 he finished off Game #2 of the NLDS in a 13-3 loss to the Atlanta Braves. In 1998 he finished up Game #2 of the NLDS earning a win, even though he had blown a save against the eventual NL Champion; San Diego Padres. In 1999 he won the Relief Man of the Year Award , saving 39 games and struck out 124 batters in only 74 innings. He set a new MLB record for strikeouts per 9 innings (15) including, striking out the side 15 times as well as posting a 1.57 ERA. The Astros made their third straight post season that year as well. In 2000 he tore his flexor tendon and missed most of the season, he returned in 2001 to save 39 games and be a leading candidate for the Comeback Player of the Year.He also made two appearances in the NLDS against the Atlanta Braves. His contract year of 2003 may have been his best season, saving career high 44 games, with 105 strikeouts in 86 innings pitched and a 1.78 ERA. That June he was one of six Astros pitchers, to combine for a no hitter, against the A.L. New York club. From Houston he went to Philadelphia for two seasons and saved 21 then 38 games respectively. In 2005 he stated to the press the Phillies had no chance in making the playoffs. This of course irked some of his teammates & some of them confronted him. Outfielder Pat Burrell actually came out & call him a rat in public. At the end of the season it was no surprise he did not resign with Philadelphia. 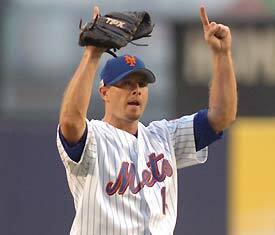 In 2006 Wagner signed on with New York Mets as a free agent. He got his first Mets save on opening day at Shea, against the Washington Nationals. Wagner had a great start as a Met, he didn’t earn a loss until late June, by that time he was 3-0 with 14 saves and a 2.14 ERA. He rolled through the summer and was one of the best Mets relievers in years as he was able to close out the 9th inning. 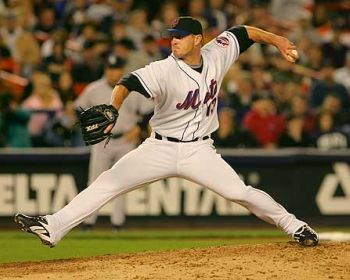 He went on to save 40 games (second best in the NL) for the ’06 Mets, going 3-2 with a 2.24 ERA, striking out 94 batters in 72 innings pitched, coming in 6th in the Cy Young voting. Post Season: In the NLDS Wagner would get credit with saves in the first two games against the Los Angeles Dodgers. He would be on the mound for the final inning of the 9-5 Game #3 series clinching win at Dodger Stadium. 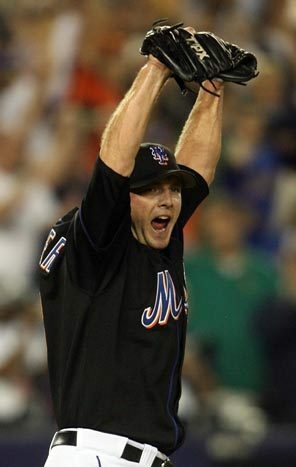 He was the first Mets pitcher, since Mike Hampton in 2000, to close out a Mets post season series victory while celebrating on a pitcher’s mound. Overall he posted an ERA of 3.00 while striking out four batters in three innings of work. 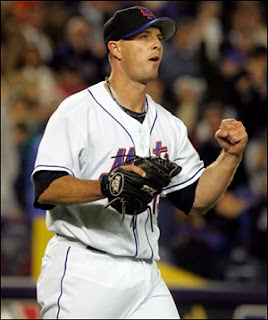 In the NLCS against the St. Louis Cardinals, he closed out Game #1 securing Tom Glavine’s 2-0 shutout. In Game #2 he came into the 9th inning with the score tied 6-6, but took the loss as he gave up a lead off HR to Sao Taguchi, then two more runs on hits by Scott Spezio & Juan Encarnacion. He did not appear again until Game #6 when he entered a crazy Shea Stadium, to nail down John Maine’s 4-0 lead. Wagner again struggled again against Sao Taguchi, who doubled home two runs bringing the score to 4-2. Wagner then got David Eckstein to ground out to secure the win. He finished the Series with one save, 0-1 with a 16.88 ERA in 2.2 innings pitched over three games. 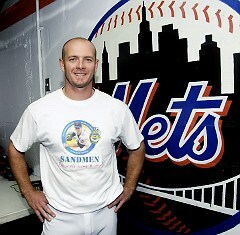 In 2007 he put in began with another fine season up until August as the Mets closer. He had an ERA under two and had saved 17 of 19 games in the first half of the season, earning him a spot on the NL All Star team. In July he was a perfect 8 for 8 in save opportunities. He had 26 saves and a 1.28 ERA by mid August when he took his first loss. He would blow four saves and post an ERA over three in the final two months of the season. 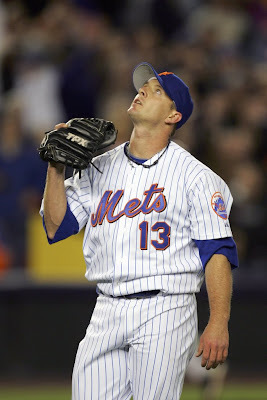 One of his worst memorable games as a Met, came on August 30th, 2007. Wagner came into the 9th inning with a 10-9 lead, but base hits by pinch hitter Tad Iguchi & Chase Utley won it for the Phils. His old teammates completed a four game sweep over the Mets dropping New York's first place lead from 6 games to just two games. This Series made a making a big difference at the end of the season, as the Mets finished one game behind Philadelphia. 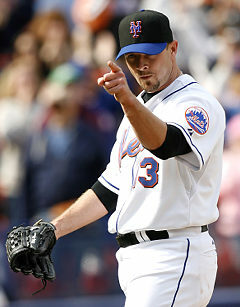 As the Mets were struggling in early 2008, Wagner lashed out on his teammates, especially the ones who were not around for post game interviews. Many believe this was meant for the Carlos’ Beltran & Delgado. It was hoped that his words would have sparked the team a bit, but in the end manager Willie Randolph got fired & the Mets missed the playoffs on the last day of the season for the second straight year. Wagner pitched well in the first half posting a 2.14 ERA with 26 saves, earning him another spot on the NL All Star team. Wagner came into the game with two outs in the 8th inning with the NL Leading 3-2. Grady Sizemore singled & stole second and then Evan Longoria’s ground rule double tied the game sending it to the 15th inning where the A.L. won it. In September he suffered a huge injury that hurt the Mets team badly, definitely having an impact on their bullpen for the rest of the year, causing them to miss the playoffs. Wagner had torn the ulnar collateral ligament of his left elbow and also his flexor pronator tendon. These injuries required major reconstructive surgery, and he was done for the year &most of the next season as well. In an emotional press conference he vowed to return but said his days as a Met were probably over, and the team should move on. For 2008, he saved 34 games posting a 2-2 record, with a 2.63 ERA striking out 80 batters in 68 innings. Wagner returned to the Mets in 2009, and made his first appearance on August 20th, striking out two Atlanta Braves. He would only pitch in two games for the Mets, before getting traded to the Red Sox for Chris Carter at the end of August. In Boston he would go 1-1 with a 1.98 ERA in five games pitched. He played in two games of the ALDS loss to the Anaheim Angels allowing two runs in one inning of work. At the end of the season he signed with the Atlanta Braves as a free agent where he recovered to have a remarkable season. In Atlanta he emerged as their closer made the All Star team & was a good candidate for comeback Player of the Year. Wagner saved 37 games (5th in the NL) going 7-2 with a 1.49 ERA. He made his final post season appearance, pitching 0.1 innings in Game #2 loss of the NLDS to the San Francisco Giants. In his career Wagner made seven All Star Games & post season appearances.